We copied pages out of the book, carried them around in our pockets, hid them under papers during class and furiously memorized throughout the day. Our guidelines were exceedingly strict– we had to be able to correctly reproduce all the punctuation, each footnote, each paragraph break, and know where each page started and stopped. During class, we’d throw each other notes with passages we were currently working on for the other person to check. It got even worse. Soon, Emera and I were communicating using ONLY phrases from JSMN we had memorized. During badminton, we would being each match by reciting JSMN from the beginning in monotone, and attempt to recite through the entirety of what we had managed to memorize so far, correcting each other’s small mistakes in wording and punctuation. Naturally, it drove our friends crazy, and eventually, away. We even have a LJ comment thread 20 posts long or so to demonstrate the point. I believe at some point we fantasized about making money off of memorizing books. Emera and I had already agreed emphatically for years that the best career would be to somehow make a living by reading. We had many dreams of purchasing lutes and harps and traveling the lands as book troubadours, singing praises of books and, um, reciting books. Okay, to be truthful, I’m not sure if this is actually a fantasy we shared or one that I harbored alone. In the end, our efforts dwindled as graduation approached, and ultimately, we had both managed to memorize the 1st chapter, or 15 pages. We kind of realized that, well, maybe JSMN was quite an absurd undertaking. Instead, our next project will be Farenheit 451, which not only is 600 pages shorter, but also poetically fitting. To this day, we can still comfortably spout out the first page or so of JSMN. It’s a skill we’ve put to good use– and so, another embarrassing story ensues. Sometime towards the end of high school, Emera and I somehow became very interested in lucid dreaming, and we invented our own amateur method of training ourselves to do so. Basically we agreed that every night while falling asleep, we’d concentrate on meeting each other in a white concrete room with one black table in the center. And atop that table would be each of our dolls (explanation later) and one copy of the 1st edition of JSMN, which we used as identifying factors. And to know we were indeed lucid dreaming, we would open the first page of JSMN and actually read the first page. Well, we thought we were splendidly clever and tried night after night to no avail. Usually we realized the next day we went to bed at different times, or forgot to try to lucid dream, or even more frequently, that both of us had fallen asleep reading by flashlight under the covers. In conclusion, nothing came of it, and that was that. 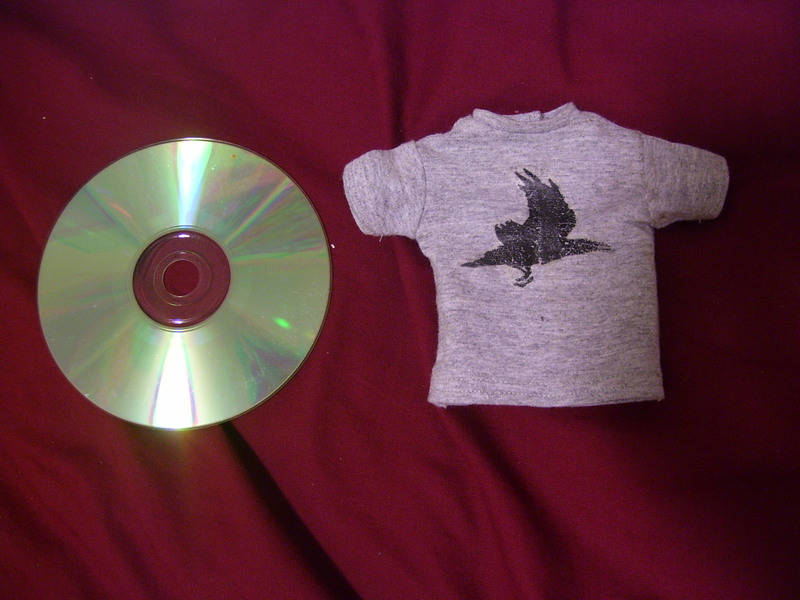 Finally, Emera and I, being ABJD collectors, made t-shirts for our dolls screenprinted with the JSMN raven logo. Or more correctly, Emera made one and I asked her for one. Also, if you ever find my LJ, I have two JSMN icons with quotes, which Emera also made for me. Annnnnnnddd, that pretty much concludes the tale of how JSMN pervaded our lives. Well, I continued to manifest my JSMN obsession in bibliophagy, and I now own 5 different editions of JSMN. They’re nothing incredibly remarkable… you’ve probably seen them floating around *somewhere*… say… for $4.99 in the Barnes and Noble bargain bins… or for $3.99 at Costco… But, below is the UK three-volume set, which I couldn’t obtain for a long time because of the price, until I suddenly found it spanking new for THREE DOLLARS in a clearance Borders section (what?!). 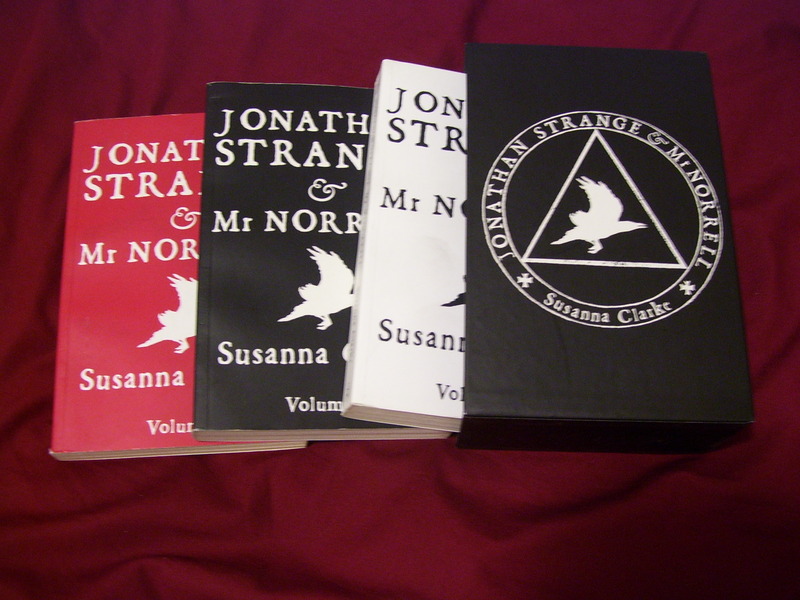 My other editions are various hardbacks and paperbacks, but most importantly, I also recently acquired a signed copy of JSMN 1st edition, 8th prining from Books of Wonder =D I don’t have images for all because most of my other editions are currently lent out and the signed edition is not much to look at. In other news, I am sitting forlornly in front of my laptop watching the time tick closer to 7pm. For at 7pm, Margaret Atwood is coming to town, or more specifically, to do a reading at the First Parish Church of Cambridge. Margaret Atwood, a great heroine of my life, is coming to town and *I will not be there*. I somehow only discovered this 10 minutes earlier, despite my obsessive daily perusals of the Harvard Book Store author events, and since I have other rather concrete obligations, I will not be going. I will not be asking her to sign my three editions of The Handmaid’s Tale. Instead I am writing about memorizing books, drinking milk from the carton, and shoveling underbaked chocolate chip oatmeal pecan cookies down my throat. Wah! I’m so sad for your Atwood-missing. :( Hopefully J got something signed for you? No… he didn’t go =/ I couldn’t make him go alone. Oh yay, fellow JSMN obsessives! You can sympathise with my plight, it’s autumn in Britain and my copy sits mouldering in a midwestern basement about 3000 miles away…Memorizing JSMN sounds like a project my high school self would have totally tried out. Why are you drinking milk from the carton? Why are you sometimes more of a man than I am? Ack, it needs to be winter break so I can curl up with this book( I bought it not long after I commented on your post). It’s sitting behind my chair…taunting me. I’m afraid to read it because I’m the sort of person who can’t put books down until I’ve finished. 800 pages is a lot of time lost when you’ve got 20 seconds of animation to work on! Anda – JSMN is *such* a perfect winter break book – I hope you get the chance to read it even sooner, though!